Technique Analysis Part 2: Revisiting Alistair Overeem's UFC Bouts -- Stance, Distance, and Hand-Positioning. I urge you to consider whether it’s also a coincidence that Overeem was praised for having his hands-lowered, and then go on to fight Antonio “Big Foot” Silva with the same style. Remember, this is someone who’s never fought with this stylistic choice before — in fact, “The Reem” was rather well-known for his disciplined guard. Testosterone Controversy and Assault Incident: Going into this bout, Overeem was out of competition for a year and two months. After beating Brock Lesnar on December 30th of 2011, he was set to face Junior Dos Santos for the belt on May 26th, 2012. During this time, he also had to deal with the possibility of jail time for a battery charge. On April 4th, Overeem was suspended for failing a drug test — high testosterone. What exactly is “K-1 Level Striking”? Well, it’s pretty broad– all it really means is that Alistair Overeem can compete (and win) against the best kickboxers on the planet. But it’s important to consider that stylistically, Overeem has never been a “master of all trades”, but perhaps entering the UFC made him think he was. Look at his bouts against Tyrone Spong, Gokhan Saki , or Peter Aerts in 2010 and you’ll notice a few trends. Overeem Uses Stationary Defence — “Peek-a-Boo”: This is the type of guard maintained throughout his career (K-1 and MMA), and tightening it when he’s in danger. It’s a defensive stance and guard, usually blocking and deflecting to counter, or “weather the storm and then explode”. Glove Size: It’s important to note that gloves play a significant role in this type of defence. The size of the fist increases on both competitors, and this influences the area of where the punch can land. In kickboxing, compared to MMA, a high-guard offers much more cushion and protection, and a punch is harder to sneak through as a consequence. Evasion in the UFC: In Overeem’s UFC bouts, he’s attempting to “slip and counter” rather than block and counter — two very different modes. This was consistently displayed against Lesnar and Silva. But to use evasive movement effectively, one needs good head movement, footwork, and shoulder movement (e.g.Anderson Silva). 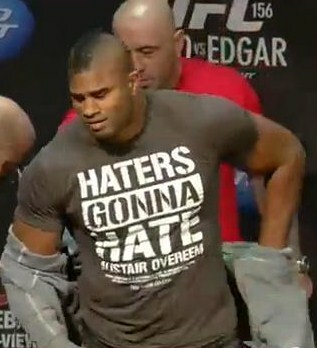 This isn’t it [picture of Overeem] — shoulder protection isn’t even in the equation here. A Tight, High-Guard: more difficult to be aggressive with punches, but Overeem could often use the guard to setup knees in the pocket in K-1. This range does not exist in abundance in MMA. With the threat of a takedown, one should not stand directly in front of the opponent with the hips open ready to launch a knee. This is why clinch game is very important to set up knees in MMA — if one wishes to throw knees in abundance. Carrying the Hands Low: This is how Overeem “easily” setup his clinch game — against Lesnar he’d sink in a right-underhook first and then go for two knees. When he had Lesnar hurt, he started doing anything of his choice. This served several purposes: made him look good, and it negated Lesnar’s takedowns. Against Antonio Silva, this again allowed him to setup clinches — off the left-hook to the body [GIF] [left-hook Gif 2] and during other punch engagements [GIF] – Punch and Clutch coined by Jack Slack: article. This made him look “really good” for a while once again. Notice the availability of the underhooks. Notice how the left-hook matches up with Silva’s body. Also notice how heavy and long Overeem’s stance is — more difficult to straight up knee like this. In K-1, Overeem stands significantly taller and his stance is less wide. Overeem does not need to lower his center-of-gravity as often without the threat of takedowns. Doing so would cause him to receive many leg kicks, and since he doesn’t particularly punch well off being kicked, he chooses to stand taller. Standing tall and kneeing from punch distance. Scoring a throw doesn’t have much utility in kickboxing — it does not score. One can more safely engage into the “Thai Clinch” off a high-guard (opponent’s head and the clincher’s hand are similar height). Height matters in the clinch game as it decreases or increases the time needed to travel to the leveraged hold. In kickboxing, the clinch is broken up shortly after it’s engaged. In MMA — the clinch is usually sustained for much longer *important. Weight Difference: Overeem was significantly bigger than his opponents in K-1. This allowed him to push them around simply by walking them down. He’s much tougher to push back as he’s like a “brick wall” to them. Energy Expenditure, Clinch, and Weight Matching: Clinching is a very tiresome game. It’s one thing when you’re doing short-bursts against significantly smaller opponents, and another to do it against Antonio Silva — a giant who walks around at nearly 300 pounds. Close-Range and Mid-Range Punches: This is the range that Overeem excelled with in K-1. Kneeing-off in punch-range, or throwing hooks. Overeem does not throw straight punches, or push-kicks in abundance, nor is he particularly successful with them. Testerone Drop ?? … Overeem was visibly less athletic in this bout. Since Overeem started his amazing run in late 2007, there’s an interesting trend. In K-1: 2007-2010, Alistair Overeem was 9-2 ; out of his 9 wins, 7 were first round knockouts. Of his two losses, one was a decision loss against Remy Bonjasky and another was a first round TKO by Badr Hari. In MMA, every win except 2 was a 1st round knockout — Fabricio Wedum was a decision and Paul Buentello was a 2nd round TKO. That’s 10 first round knockouts in a row — and 17 in total. Antonio Silva is 1 of 4 men (in kickboxing and MMA) to make it to the third round, and at the time of his victory, 2 of 4 to beat him. The Statistics Say This: if you can weather the storm in the first round with Alistair Overeem, you have a much better chance on making it to the decision or winning. Knowing yourself: Elite striking, but in particular specific range — mid to close-range (didn’t use it). Instead, he opted to keep his hands-low to engage a clinch (utility lessened against a non-wrestler — Antonio Silva). Keeping hands-low also makes it more difficult to strike to the face (*if you aren’t very competent in countering off evasive movements — Overeem is not). This makes the evasive movements mostly one mode: defence; defence will only only last so long until you get struck. One must be able to strike effectively off evasive defence, not interchange between it and offensive [GIF]. Overeem was not able to sustain clinch for more than two rounds before getting tired — he didn’t factor in how tiring it’d be to evade and clinch a 300 pound man. Overeem did not spend his energy wisely. Knowing the Enemy: Mainly a puncher with a dangerous top game but can’t really wrestle. So why fight him with a similar style to fighting Brock Lesnar? What is achieved, other than the praise of masses, especially when everyone already expected him to win? Is it necessary to win in a way analogous to how Anderson Silva does it? The Grounds on Which you Fight: Fight in top position (did for the 2nd round); be wary of punches (barely evaded when with a gas tank) — didn’t (or couldn’t) in late 2nd round and 3rd round. It’s tragic to see that Overeem didn’t use a bulk of the elite skills and techniques he employs regularly. At many times during the fight, he operated in an unfamiliar distance. This not making the opponent fight your game… This is fighting his game, and this is the result. As always, thank you for reading. To read the discussion on Alistair Overeem vs. Travis Browne — follow this link. To stay updated, you can follow me on Twitter or add me on Facebook : the links are located below.